"December 2017 saw a year-over-year (YoY) growth of 4.5 percent in worldwide air cargo volumes. Main contributors were the origin regions of Asia Pacific (plus 8.0 percent) and North America (plus 5.1 percent). Europe's growth was 2.2 percent only, whilst air cargo originating in Africa contracted by 7.5 percent. "MESA (Middle East & South Asia) and Central & South America saw an increase in step with the worldwide average. It was Europe that grew most as a destination (plus 6.8 percent). Yield developments, however, drew most of the attention: Worldwide yields were up by 10 percent YoY, measured in €, and by a whopping 23.5 percent in US$. "Compared to November, US$ yields rose by 2.5 percent, another noteworthy feature, as yields usually drop between November and December. "For the four quarter as a whole, YoY volume growth was 6.6 percent, impressive in the light of the fact that air cargo - after years of a lackluster performance - started to grow again from September 2016. Of course, this fact made it more difficult for the industry to record strong year-over-year volume growth figures in the latter part of 2017. However, that difficulty did not stand in the way of serious revenue growth for the airlines in Q4, as yields in US$ started to grow with double-digit percentages from September 2017. "Capacity shortages in a number of markets, rate-of-exchange fluctuations, and rising oil prices all had a role to play in the resulting worldwide airline revenue growth of over 25 percent in the last quarter of a truly remarkable air cargo year. "While general cargo increased by 10.5 percent, specific cargo products grew 7.4 percent, making for an overall volume growth of 9.6 percent or 10.8 percent in Direct Tonne-Kilometers (DTK). 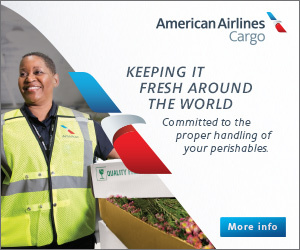 Yield improvement in US$ was also larger in general cargo - plus 9.4 percent versus plus 5.9 percent. "The categories with the highest volume growth were Valuables & High Tech., Pharmaceuticals and Flowers, with US$-yield increases of 8.0 percent, 5.4 percent and 1.0 percent respectively. "The Top-20 forwarders in the world remained an exclusive club in 2017, not allowing new members to join them, and their expansion was in line with the overall market growth although the Top-5 - DHL Global Forwarding, Kuehe + Nagel, DB Schenker, Expeditors Int'l and Panalpina as a group outgrew their colleagues with rises of 16 percent versus 14 percent. "GSA's fared best in the Asia Pacific region with volume growth of 15 percent followed by Europe at 12 percent and MESA 11 percent. "Of the 50 largest origin cities, four recorded increases of well over 20 percent: Hanoi led at 25.5 percent followed by Brussels, Colombo and Ho Chi Minh City. Hong Kong remained the No.1 origin point, expanding at 16 percent. "Of the Top 10 origin points, Amsterdam and Los Angeles showed slightly less growth than the worldwide average. Among the largest destinations, Doha, leading with 42 percent, Shanghai, Osaka, Hanoi, Mexico City, Chennai and Campinas (São Paulo) all grew their incoming volumes by more than 20 percent. "The shares of total business for the individual airline groups remained reasonably stable with the exception of airlines from Africa. While business from their region lagged behind, their overall growth was much higher than the growth realized by other groups. Carriers based in Asia Pacific grew a bit more than average in 2017, while airlines based in Europe, the Americas and MESA lagged behind, albeit only slightly, thus giving up a tiny part of their overall share of the pie. "With positive trends continuing throughout the past year, the big question is of course how long all this will continue. As Mark Twain reportedly once said, it is difficult to make predictions, particularly about the future." Just-released IATA figures show that 2017 demand, measured in freight tonne kilometers (FTKs), grew by 9.0 percent overall – more than double the 3.6 percent rise for the previous 12 months. Meanwhile capacity rose 3.0 percent in the same period, the slowest increase since 2012, suggesting one explanation for the "remarkable" WorldACD data – FW.